The all-new Kawasaki Z900RS CAFE motorcycle, produced in limited quantities for 2018, adds a classic front fairing, stepped seat, and black low rise handlebars to the nostalgic Z900RS adding another inspired design to Kawasaki’s retro style line of motorcycles. In building the Z900RS CAFE motorcycle, Kawasaki has once again meticulously crafted one of the most authentic retro-styled machines in appearance and design, paying homage to an era of motorcycles that shaped the Kawasaki brand. The Z900RS CAFE takes styling cues from iconic Kawasaki models including the Kawasaki Z1-R, Eddie Lawson Replica KZ1000R, and GPz models, all while tastefully incorporating modern technology and features. Developed for riders in search of a well-rounded bike that is not only rich in history and character, but also packed with modern technology and handling. The Z900RS CAFE is powered by a 948cc in-line four engine, features a modern trellis frame, and modern suspension components that bring an unmatched level of performance. 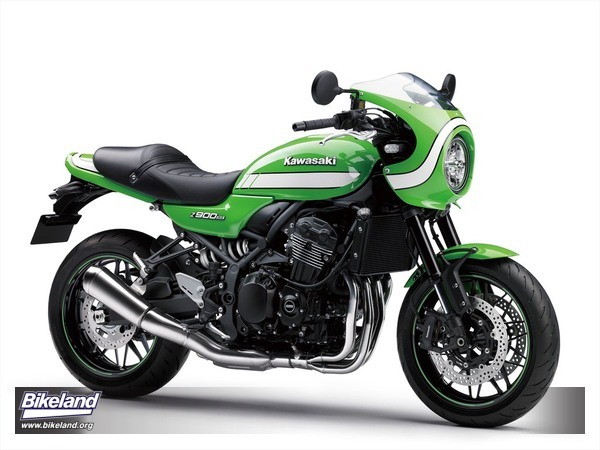 By blending the sleek sweeping contours of the Z900RS with Kawasaki’s classic cafe racer styling and class-leading performance technology, Kawasaki has yet again created another truly authentic motorcycle. The Z900RS CAFE received the same meticulous attention to detail in its construction as its predecessors did, from the Z1 inspired teardrop gas tank to the simple uncluttered engine design, all the way down to the sporty vintage inspired fairing and tail section. A few of the eye-catching features of the Z900RS CAFE are the beautiful sporty front fairing, black low-rise handlebars and iconic four and a half gallon teardrop fuel tank, which were inspired by the styling of the Kawasaki Z1 and the Z1-R. The entire frame was designed around positioning and showcasing the beautiful cafe-racer aesthetics of the bike. The retro vibe also influenced much of the look of the front end as well, such as the large 170 mm LED headlamp, which blends old school looks and modern designs. Position lamps in the high-beam chambers ensure the whole lamp appears lit, like a retro-style bulb headlamp; a convex lens and chromed headlamp ring add to the high-quality finish and appearance. The iconic Kawasaki styling of the 70’s and 80’s inspired the flowing design of the seat and rear cowl on the Z900RS CAFE. The oval design of the LED taillight also pays homage to its Z1 lineage. Unlike standard LED taillights that appear as a collection of dots, the surface-emitting LED taillight lights up as a solid surface. An analogue-style speedometer and tachometer give off the retro vibe for the gauges, which is contrasted by a multi-functional LCD screen with an easy-to-read black and white display that continues the theme of blending retro styling and modern technology. The cast aluminum wheels chosen for the Z900RS CAFE feature flat spokes designed to look like classic wire-spoked wheels. The wheels offer a balance of lightweight and stylish looks, contributing to both handling and a design suited to the retro category. The Z900RS CAFE, features a liquid-cooled, DOHC, 16-valve 948cc inline four cylinder engine. Its design and configuration offer a great balance of power and manageability, delivering strong low and mid range torque that provides all riders the reassuring feeling of control. Several engine components played a crucial role in achieving the smooth, reliable, consistent power needed for the Z900RS CAFE. Utilizing the downdraft positioning of the 36 mm throttle bodies was crucial in allowing intake air to travel in the most direct route to the combustion chamber, which is all complemented by ECU controlled sub throttles that provide silky smooth throttle response. To facilitate smooth shifting the gearing ratio of the Z900RS CAFE was designed to have a short first gear, making it easier to launch. It also features a longer sixth gear for improved ride comfort when touring or cruising at highway speeds and also allows the engine to operate at lower rpm, which in turn results in improved fuel efficiency and reduced engine vibration. The Z900RS CAFE features a high-quality clutch with assist and slipper function working in unison with its transmission. Additionally, the back-torque limiting slipper function of the clutch contributes to stability by helping to prevent wheel hop during downshifts. While the Kawasaki inline-four cylinder engines have been historically known for their great-sounding exhausts, Kawasaki has used sound research to craft an ideal exhaust note. Sound tuning on the Z900RS CAFE was focused on the initial roar to life, idling, and low-speed riding where the rider is best able to enjoy the exhaust’s deep growl. To ensure both performance and the desired sound were achieved, every aspect of the exhaust system was scrutinized: exhaust pipe length, collector design, where to position the bends, even the density of the glass wool fibers in the silencer. More than 20 renditions of the system were tested before finding the perfect match. Clever internal construction of the pre-chamber achieves a balance of sound and performance, and at low-rpm, the exhaust escapes in a straight line, while at high-rpm the exhaust is routed through an additional passage. The high quality stainless steel exhaust system features a 4-into-1 collector layout. The header pipes and pre-chamber are built as a single unit. The exhaust headers feature a double-wall construction, which helps to minimize heat discoloration and provide protection from the elements. The compact stainless steel megaphone-style silencer contributes to the retro appearance of the Z900RS CAFE. To ensure the highest quality finish possible the header pipes are all treated with a special three stage buffing process: the first is done as individual parts, the second is done once the exhaust is assembled, the third stage is a final buffing process. To achieve the desired weight, handling characteristics, and appearance, the Z900RS CAFE received a high tensile steel trellis frame. The lines of the frame were made as straight as possible, only utilizing bends when necessary, which has created a frame that disperses stress extremely well and enhances handling. Also aiding in the pursuit of lightweight and performance handling is the rigid-mounted engine, which is connected at five points to the frame: front and rear of the cylinder head, behind the cylinder, and at the top and bottom of the crankcases. Its minimalist design has helped to trim all unnecessary weight while showcasing its retro styling. The Z900RS CAFE has a laid back and relaxed design, which was achieved by raising the front and lowering the rear. Complementing the ride comfort of the all-new performance designed trellis frame is a 41 mm inverted fork and Kawasaki’s Horizontal Back-Link rear suspension design. The high-grade fork features fully adjustable 10-way compression and 12-way rebound damping, enabling riders to find their precise settings to suit their preference and riding style. 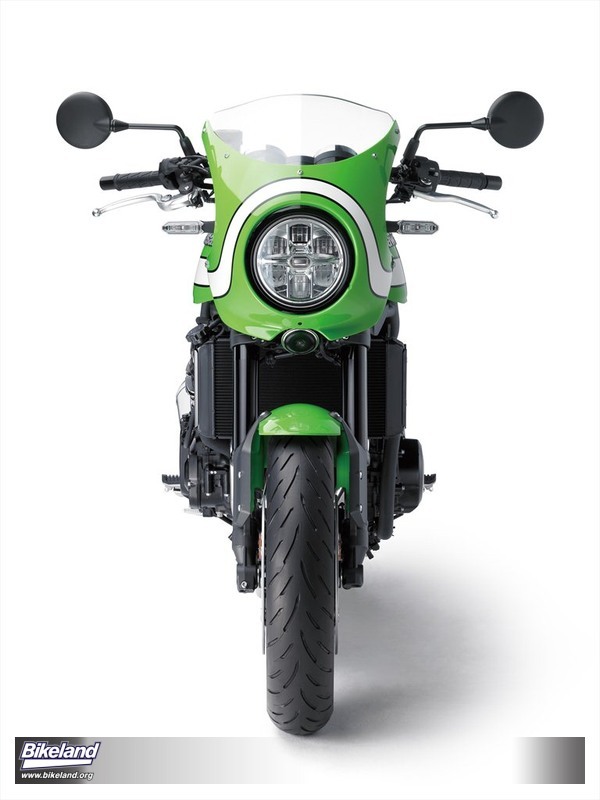 Enhancing the performance of the rear is Kawasaki’s Horizontal Back-Link rear suspension design. The rear shock features fully adjustable rebound damping and preload. This arrangement contributes to mass centralization while ensuring that the suspension is located far enough from the exhaust that it is not affected by heat. Handling the stopping duties of the Z900RS CAFE is a full disc brake setup featuring modern ABS. The radial-pump front brake master cylinder commands a pair of 4-piston radial-mount monobloc calipers to grip a pair of 300 mm brake discs, providing plenty of stopping power. The rear brake features a single piston, pin-slide caliper gripping a 250 mm disc. 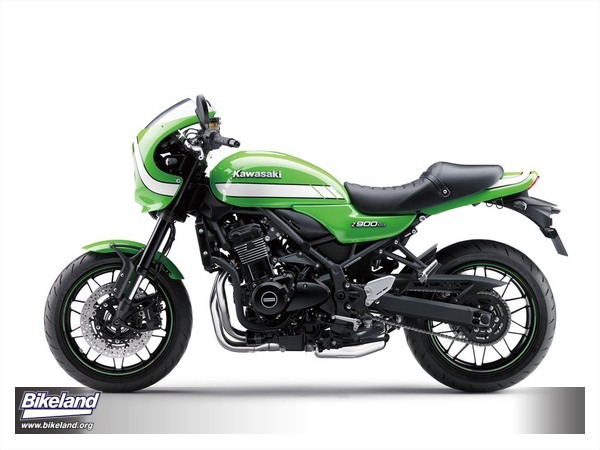 The Z900RS CAFE is equipped with Kawasaki TRaction Control (KTRC), which has two performance settings riders can choose from: Mode 1 prioritizes maximum forward acceleration, while Mode 2 provides rider reassurance by facilitating smooth riding on low-traction surfaces. When selected, Mode 2 utilizes the same logic and control as Mode 1, but enables riders to better negotiate both short patches of slippery terrain, such as train tracks or manhole covers, and extended stretches of other less predictable surfaces. Wheel spin is also limited when starting on a low-traction surface. However, when excessive rear wheel spin occurs, Mode 2 switches to three-way control, which governs the ignition timing, fuel delivery and airflow, and engine output is reduced to a level that helps the rear wheel to regain grip. This fine control results in a very natural feeling with smooth engagement and on/off transition. Riders may also elect to turn the system off to enjoy the raw feel of riding.